Facebook has many useful social plugins for increasing traffic to your website or blog. Now, Facebook released their latest social plugin named Facebook Recommendations Bar. This tutorial will guide you "How to Add Official Facebook Recommendations Bar Widget To Blogger Blog". This plugin allows any users to share and like content. Only those articles are displayed that are previously liked or shared on Facebook. The number of likes are displayed under each article along with page title and a thumbnail. It also contains a like button. Now this tutorial will show you how to install latest Facebook Recommendations Bar widget to blogger. In the box that pops up, type "Recommendations Bar" inside the App name field and leave other options as default. Click continue. You are app is almost complete. 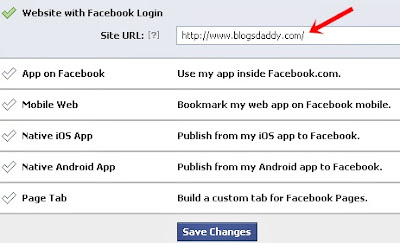 Just click Website with Facebook Login tab and inside the box input your blog URL. See the screenshot below. Do not touch remaining options and click Save Changes. Now, you will see 2 line codes on the top of application. One is App ID and the other is App secret. Just copy the App ID code and keep it save in a notepad. We will need it later. This will make the plugin compatible in older versions of internet explorer also. Since blogger templates are coded in XML therefore inserting this XML namespace will enhance the plugin performance and compatibility. Note: If you are using the new blogger templates like Simple, Awesome Inc., Travel, Watermark or Picture window then please search for <body instead. Make sure to paste the code below the entire body tag. Replace *************** with your 15 digit App Id that you saved in step1. Save your template and you are all done! max_age: will decide the age limit of articles. Sometimes you don't want to display too old articles so you can set it to display up to 1-180 days old posts. But if you don't want to take age into account then let it be 0 as default. read_time: As soon as the user reaches a specified location, the plugin would expand and before expanding it will take some time. I have kept it equal to 10 seconds, you can increase it to 30 or more as you wish. trigger: On page load the plugin collapses and as soon as it reaches a specified location it expands. You can choose that location in three ways i.e. onvisible, X% or manual. I prefer locating the trigger point by percentage for better pageviews. The widget will expand as soon as the user scroll downs 40% of your page. You can increase or decrease this value. If you wish that the plugin must expand as soon as the reader reaches the end of your article then instead of pasting the code between the purple lines paste it just below data:post.body tag and use the value onvisible instead of 40%. The widget will display only on post pages and not on homepage or static pages. To display it on all pages, then simply delete the purple bolded lines. Save your template and now see the plugin if it correctly shows page titles both on your blog and Facebook. Whole credits goes to MyBloggerTricks.com. This is awesome widget for blogger users, So I'm sharing on blogdaddy blog. If you have any problem regarding this widget please ask via comment.